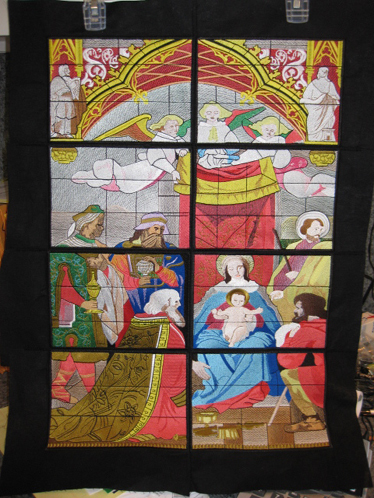 This Nativity project involved 2-1/2 to 3 hours per panel -- 8 panels total. The entire project totals nearly 600,000 stitches. Yes, you read that correctly! 600,000 stitches! I stitched all panels together after they had all been completed, then I added fabric borders to all sides. This large project may be either made into a wall hanging or may be framed, as in these photographs. 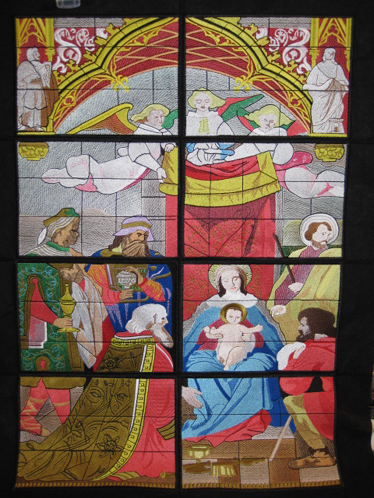 This item resembles a stained glass window as is seen in many churches. The Adoration of the Magi was digitized by BF-C Creations. The completed stitchery was framed by Uniques Custom Framing & Art Gallery of Brenham, Texas. Considering the amount of work involved in this project, I felt it was appropriate to have Conservation Glass used to protect this stitchery--to eliminate any fading of the thread colors. This is truly "church quality" when it is finished. The cost for this type of work is $350 + tax, for an unframed piece. If you want me to have it framed before it is shipped or picked up, add approximately $100-$110 to the cost of the stitchery.